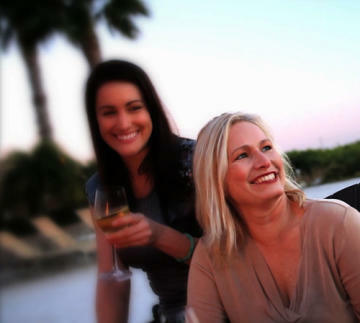 Waterfront location brings the warmth and light of the Florida sunshine right into your meeting rooms. Treasure awaits you at the Tampa Convention Center, a 600,000-square-foot meeting and convention facility with unique architectural designs and spectacular waterfront views that provide an ideal setting for your next invasion. The convenience of a vibrant downtown, adjacent first-class accommodations and Florida&apos;s largest variety of destination offerings allows you to conquer with ease. 22 covered bays on the exhibit hall level. Entrance into the exhibit hall is available through three (3) freight doors, which measure 14&apos;x25&apos;, 20&apos;x25&apos; and 30&apos;x25&apos;. First-floor loading dock houses four bays to service the meeting rooms and ballroom. A 10&apos;x20&apos; 10,000-lb. freight elevator connects the two levels. Tampa’s walkable hotel package offers more than 3,000 rooms across familiar brands with appealing variety in product and price points. Attendees may access the waterfront convention center along the scenic Riverwalk, by streetcar, water taxi, trolley or other modes of transportation. The neighboring Westshore Business District includes an additional 8,000 rooms within close proximity. Tampa Convention Center’s Bay Bistro and Sail Pavilion offer waterfront concessions and cool cocktails overlooking beautiful Tampa’s Riverwalk. Sail Pavilion is Tampa’s only 360-degree waterfront bar conveniently located between Tampa Convention Center and Tampa Marriott Waterside Hotel & Marina. 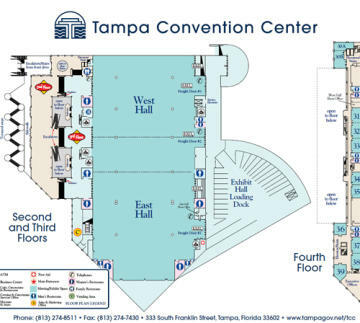 Tampa Convention Center’s first level (PDF) features a 36,000 square-foot, divisible ballroom, 25 meeting rooms including 10 dramatic waterfront rooms, a three-story rotunda and Bay Bistro concessions. 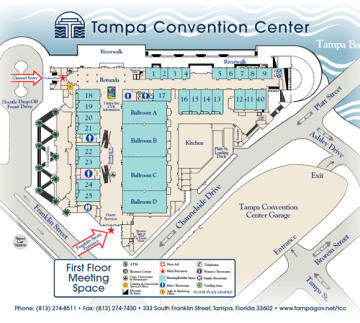 Tampa Convention Center’s upper levels (PDF) feature a 200,000 square-foot, divisible exhibit hall, exhibit hall loading docks, show offices and an additional 10 meeting rooms. The private dining room at Terra Gaucha Brazilian Steakhouse in South Tampa is available for board meetings, small groups and other functions at no fee. The space comfortably seats up to 32 for full service meals, receptions, private lunches, celebrations and more. Lunch and dinner packages are available for groups booking the private dining room.